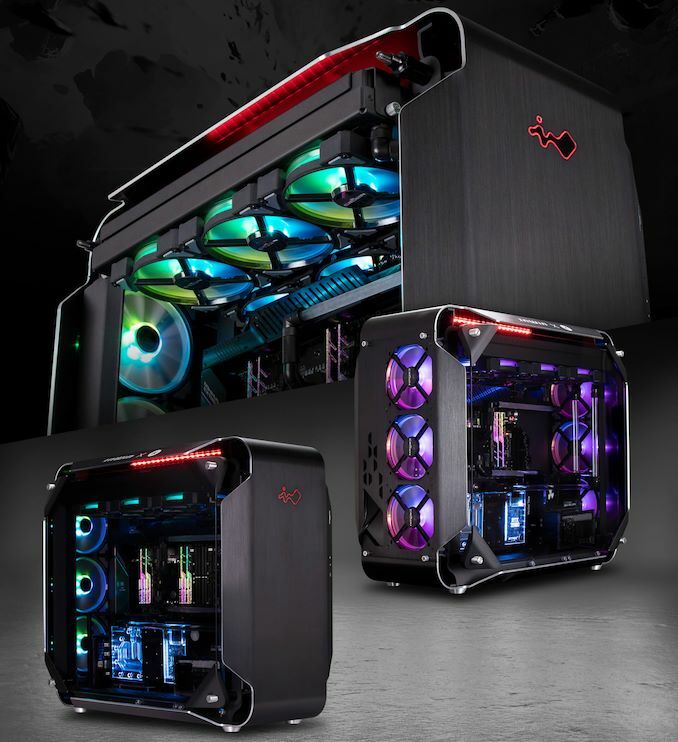 The emerging category of extreme workstations has brought with it a new market for larger PC cases better suited for housing this high-end equipment. To that end, at CES this year InWin demonstrated its new 928 chassis, which is specifically designed for machines using Intel’s Xeon W-3175X processors. The PC case can accommodate an Extended-ATX motherboard, two PSUs, and a sophisticated cooling system. And with a price tag of $900 – almost a complete mid-range PC –- it's distinctly priced to go with Intel's high-cost 28-core processor. 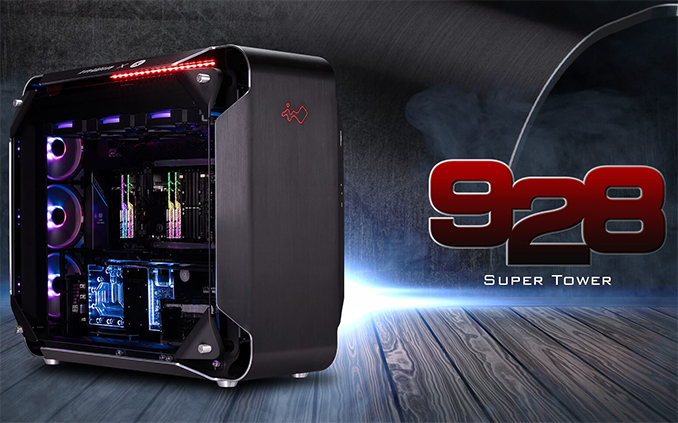 Like other modern high-end chassis, the InWin 928 'SuperTower' case has side-by-side compartments to separate airflow. It features windows made of tempered glass to allow everyone to see the hardware inside inside. One of the chambers houses the system’s motherboard (e.g., the ASUS ROG Dominus Extreme) with CPU (e.g., the Intel Xeon W-3175X), up to two graphics cards (up to 480 mm length), and various storage devices. Meanwhile the other compartment holds up to two high-wattage PSUs, which given the kind of heat those can produce, makes a lot of sense for why InWin would want to place them into a separate chamber. When it comes to storage, the PC case can support up to two 3.5-inch HDDs as well as up to six 2.5-inch drives, which is somewhat unusually HDD-lite for a workstation. Meanwhile, following the latest trends, the InWin 928 does not support ODDs, so no Blu-ray movies for owners of Intel Xeon W-3175X-based workstations. Meanwhile, the InWin 928 has a USB 3.1 Type-C port, two USB 3.0 Type-A ports, and the usual audio jacks on the front. On the cooling side of matters, the InWin 928 can accommodate two 420-mm radiators for liquid cooling systems on its top. Alternatively, it can support six 140-mm fans on top, three 140-mm fans at the front, and three 140-mm fans at the rear. Even if equipped purely for air cooling (12 fans in total), the case should provide enough cooling even for the Intel Xeon W-3175X and NVIDIA’s TITAN RTX. Since the InWin 928 case is compatible with EATX (14×14-inches) motherboards and has two compartments, the chassis is huge: it is 668 mm tall, 582 mm deep, and 377 mm wide. 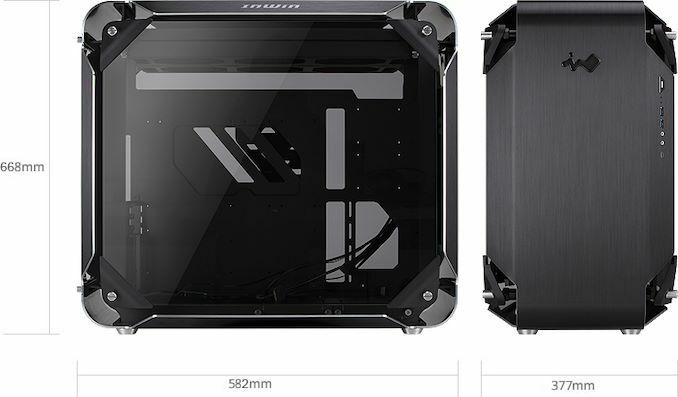 Internal 2 × 3.5" and 6 × 2.5"
Given its unique market, we expect InWin to start sales of its 928 PC case around the time when Intel releases its Xeon W-3175X processor. The price of the chassis is expected to hit $900, which is not exactly surprising given the low volume and the high margins that W-3175X systems will fetch. $900 ?? For a darn ....case?